A mobile phone can be usefull and fun to have. However, enterign phonenumbers in the phonebook of your mobile phone can be a though job to do ... In particular when transfering phone numbers from one phone to the other. For those who have a MasterA programmer there is a great tools out there allowing you to edit the SIM-card, including the phonebook that is stored on that card. On this page I'll try to explain, briefly, how to do just this. Note: Chipcard Reader, the software used for editing the SIM-card, has been created to edit SIM's as seen for GSM mobile phones. I do not know if this works for non-GSM-network SIM's as well! If you don't have one yet, you can order one at Mastera.nl (Dutch!) and Techtronics (UK). This trick works with both MasterA models (I aand II)! Software to edit the Phonebook. You can either download it at WeetHet (Engels, version 2.14) or at Teledata. An adaptor to hold the SIM-card. And last, but not least, the actual SIM. This is a little card that's in your mobile phone right now, usually below the battery. So, we need to get that SIM-card and push it back into the SIM-card-holder. Make sure you insert the SIM in the proper way into the holder. Watch the notch on the SIM-card. Tip: It is very well possible that the SIM will fall just right out of the holder. Bij putting some tape on the back of the holder-card, covering the hole for the SIM-card, the SIM will remain in position. 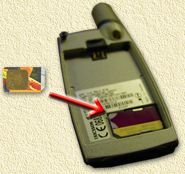 Note that the tape should not be on the same side as the golden contacts of the SIM, and thus not cover these contacts, otherwise the SIM cannot be read. Unzip the file (use either WinZip or WinRar). Start the SETUP by double clicking the unpacked "setup.exe". A lot of questions will pass your screen, answer them by clicking the "Next" button (5 times) and finally the "Finish" button to complete the setup. Before we start the Chipcard Reader software, first connect the MasterA to a COM-port (for example COM1). Make sure the MasterA powered ON. Set the MasterA to mode 6. You can now insert the SIM-card (+holder) into the MasterA. Now you can start the software, just make sure the MasterA is set to mode 6! Start the software, you can find it in the Windows Start menu, at"START" - "PROGRAMS" - "Chipcard reader". The program has not be set to know at which COM-port the is connected MasterA. Click the "Yes" so the program can discover where to find the MasterA. In this picture, you can also see the 2 possible status indications of the inserted SIM-card. Situatie B: OK, all looks well, we can start using the program. You probably have seen a brief message indicating that Chipcard Reader has been talking to your SIM-card. Note: Some data you better not change since the will possibly eliminate the particular services and/or functions that you do not want to be eliminated! So unless you're a 100% sure that you know what you are doing, limit editing to the Phonebook only. In order to edit the phonebook, choose the menu "GSM-Card", option "Edit Phonebook" (or press the F5 key). Last D. No. Last Number Dialled. Depending on your mobile phone and the settings in your mobile phone, this shows the 10 numbers you dialed last. Serv. No. Service Call Numbers. These are service numbers to be set by the provider. So basically you don't want (and you don't CAN) to change anything here. Barr. No. Barred Call Numbers. See also Fixed No. This is of use for company mobile phones, these numbers are used to limit the phonenumbers a user can call. Here we find the numbers that are blocked. Most mobile phones use these phonenumbers for their phonebook, these are the onces we should edit, if needed. See also Barr. No. This is of use for company mobile phones, these numbers are used to limit the phonenumbers a user can call. These are the only numbers the user can call. Own No. Own Phone Numbers. Here you can enter the phone number of your mobile phone. It's basically of nu use when using prepaid cards, but can be usefull to indicate which line is being called, for example when you subscription has both a voice and a fax phone number. We are about to edit the Phonebook, so click the "Abbr. No."-tab. Reads the content of your SIM-card. Writes the content of Chipcard Reader back to the SIM (changes included!). Copies the entire SIM for backup purposes. You can store the backup on the harddisk of your PC. Guess what? This allows you to restore a previously made backup of the SIM-card. Pretty usefull when you screwed up. Displays SIM-card information (read-only) like provider name, services, etc. Here we are,... edit the phonebook. This is for editing, reading, printing, saving and creating (not sending - you will need your mobile phone for that) SMS messages. Here you can see and edit a list of prefered providers, needed when roaming (i.e. using your mobile phone abroad). Here you can also see a list of providers that are forbidden (you cannot change this list). This is used for monitoring costs of all possible calls etc. Particular pages allow you to print lists of data presented on that page, for example a list of all phonebook entries, SMS messages, etc. N Clear - Deletes the entire line/record! After reading the SIM-card, press the button "C" - Card Backup. The program will prompt you for a filename, enter one that makes it clear for you what it is. Click the "OK" button. Later on, when needed, we can restore the SIM-card by clicking the button "D" - Restore Card - just in case we screwed up the settings on our SIM. Click the button "F" - Edit Phonebook. Now select the tab "Abbr. No.". Simply put; In the right column you can select an item (name or phonennumber) and edit it. Note: The number of characters used for a name is limited! Tip: To distinct between Home, Office and Mobile, you can work with prefixes or suffixes, for example add "/H" for Home, "/W" for Work and "/M" for Mobile. I personally use a prefix for phonenumbers related to my work ("W:") and a suffix for all others. You can copy on or more items from the SIM-list (on the right) to this default list (on the left). Select the items you want and click the "Accept" button to copy them. This can be pretty usefull, beacuse you can use "File" - "Save As" to store it in a file, for later retrieval. This way you can copy the list (or a part of it) to other mobile phones. Copying numbers from the default list (on the left) to the SIM-list (on the right) works in a similar fashion. Click the button "B" - Write Card. The phonebook will be written to your SIM. A dialog will show you the copy progress. Once the it's done copying (the dialog disappears) you can remove the SIM and put it back into your mobile phone. Note: If you don't plan to edit anyother SIM's, close the application. Tip: Some mobile phones, copy the entire phonebook (and others) to their own memory and uses this data instead of the data on the SIM. Exeute a "Master Reset" or "Return to Factory Settings". This will clear the local memory and force the mobile phone to read the phonebook from your SIM, so changes are reflected in the Phonebook.